Are T-bonds repeating last year’s pattern? So many investors believe that it is the Fed that determines interest rates, and thus bond prices. Or alternatively, that it is the mysterious force of inflation that drives interest rates. But the current evidence suggests it is the calendar that is really in charge. Seasonality is not historically a part of how T-bond prices behave. You can calculate an annual seasonal pattern for anything. That does not mean it will be meaningful, or reliable. Heck, you could calculate a seasonal pattern for a 9 1/2 month period, a 22 1/3 month period, or any other time period you like; the market does not have to follow it just because you or I decide that it is supposed to be meaningful. But for the past couple of years, the price plot of T-bond futures has been matching the pattern of the year before in a way that is unusual. But it has been going on long enough now to say that it is a real phenomenon. A year ago, from April to May 2015, we saw a dramatic decline. We appear to be experiencing the echo of that dramatic down move now in 2016. I can think of no good reason why seasonality should matter for interest rates—and thus for bond prices. If we were talking about an agricultural commodity with an annual growing season, then sure, annual fluctuations would make complete sense. But with $19.2 trillion in federal debt, a few billion more or less from one month to the next should not matter much at all in terms of the depth of the pool. And yet, the chart says that the repeating annual forces really do matter, whether or not it makes sense to me or to anyone else. The decline in April 2015 did not come to a stop until May 13, 2015. And the final bottom did not come until June 10, 2015. 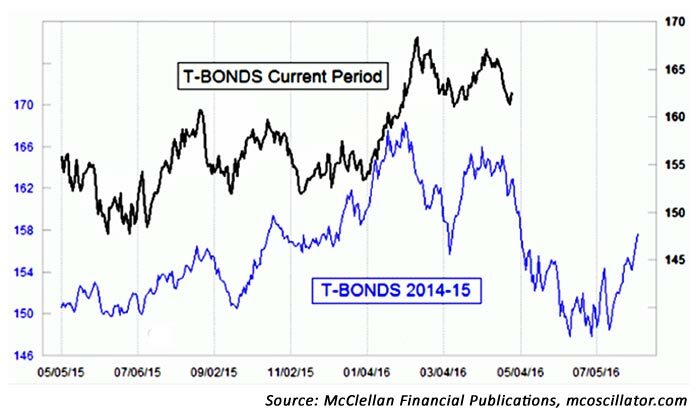 So if T-bonds continue to mimic last year’s pattern, then they have a lot further to fall. There is no guarantee that the bond market will continue repeating the pattern of a year ago. There is no guarantee of almost anything in the financial markets. But it has been working well for the past few months, and it continues to (mostly) work well even now. So the prudent course is to expect that the price action will continue to match last year’s pattern, while simultaneously looking for evidence that the correlation is breaking, as all such price pattern analogs eventually do.